HAFA stands for Home Affordable Foreclosure Alternatives Program, but don't let the nice name fool you. Proof is in the results, so time will tell. Read on. Quickly, I will give some perspective on one of many reasons why the current real estate market has become devalued and unstable. However, if you spent a week in my shoes, you may agree with my personal feelings on this program. I also will provide all of the facts about HAFA. If mortgage servicers and the government do this right, it may help you or many people you know. So every buyer wants a deal, right? It's a buyer's market... a dream come true? Not really. Very few truly know the chaotic experiences most buyers incur trying to purchase a home today. What is happening to the sellers? Their problems also mirror the buyer's problems. Approximately 7,600 single family homes currently are listed for sale in the Southeast Michigan/Detroit Metropolitan area (Macomb/Oakland/Wayne Counties). A vast majority of that number involve sellers who are "hopelessly trying" to sell their property at a price point that pays off their mortgage(s) and closing costs. They are happy to sell and receive little to no money at closing. Key word is "hopeless." These properties are flooding the market with a catch-22 situation which leaves frustrated buyers attempting to negotiate offers down to a more realistic, market price butting heads with those "equity strapped" sellers unable to sell. Typically, those same sellers are unwilling to make concessions to sell, such as paying off negative equity or performing a "short sale", which involves negotiating with their lender(s) to take less than what is owed. For most sellers, the negative impact to credit defeats the purposes of selling the home in the first place. They want to sell and buy another for a myriad of reasons. In some cases, the impact to the seller's credit is no better than if they would just "walk away." To add even more salt to seller's wounds, the Government's has added "tax credit" incentives to buyers. In order to obtain that credit, a buyer must purchase before May 1, 2010 and close before July 1, 2010. Short sales may derail the timeframe and hope of obtaining the desired incentive. The above explains why so many buyers bypass any property sold by "private sellers" and focus solely on the homes which offer an easy, affordable green light to ownership - the BANK OWNED home. Out of the above 7,600 homes, almost 1,000 homes are NOT OWNED by private sellers. So when most of the buyers focus on these homes, two things happen. First, many buyers for a limited inventory (basic premise of supply and demand) causes multiple offers on a single property, which leaves many buyers disenchanted, because every time they find a desired house, they roll the dice on receiving an accepted offer. Of the buyers who "win the bid", they also are left with "behind the scenes" struggles not encountered in traditional house sales. Second, most banks place properties on the market at very competitive prices, and many times, at prices 20%-50% below market value which spur bidding wars. With a majority of the buying public focusing on the bank-owned home, the impact to values and those private sellers is obvious. Property must be seller's principal residence. Sale cannot be related to parties (arm's length transaction). Lender must consider seller for HAFA within 30 days of request. Mortgage on property originated before 1-1-2009. Delinquency or default is foreseeable. Foreclosure proceedings suspended upon application for HAFA. STANDARDIZED FORM/PROCESS: See the links at the end of this article for more details and downloads. Unpaid principal balance is less than $729,250 and is a FNMA/FREDDIE. The monthly mortgage payment (PITI) exceeds 31% of borrower's gross monthly income. (If this does not apply, it is uncertain if the traditional short sale method will apply or if #4 is factored.) Editor Note: This could be the "hanging chad" for many sellers and it is my opinion this requirement should be reconsidered. Property must be listed with a licensed real estate agent. Real estate fees to real estate agents will not be reduced less than 6%. Second/subordinate lien holders (2nd mortgages) can be offered 3% of its principal balance up to a cap of $3,000 each, paid out of closing proceeds. Seller incentive: $1,500 towards relocation expenses. You must move out at closing or represent there are not "tenancy" agreements between seller and buyer. 14.The above is just a basic overview. The program also has specific requirements allowing homeowners to be considered for a "Deed in Lieu" (DIL) of foreclosure if a short sale is not possible. If the above does not appear to serve a simple explanation of this government-sponsored program, it actually is. Remember, we do not assume the explanations or the process will be easy. Hopefully come April, many homeowners and purchasers will embrace and enter into the short sale process. If the plan works and gains popularity, a significant increase in short sale transactions will occur, which in turn, will stabilize the markets with a reduced amount of bank owned homes. It is the "chicken/egg" relationship. Fewer sellers will walk away from their "under water" position knowing they have an escape that works. Buyers will open up to seek homes owned by private sellers. And for Realtors like myself, I can look forward to less stress and fewer trips to the psychiatrist. In order to properly interpret these figures or to find out the specific value of your property, please contact Al Block of RE/MAX First at 1-800-SOLD-678. Click here for First Quarter 2009 Macomb County statistics. ***Just click on the attached document to see the First Quarter 2009 Oakland County real estate sales statistics for your community. Real Estate …. Are the taxes for real? Taxes, like them or not, they are here to stay. As you begin your home search and browse various property listings, whether online, or as provided by your Realtor, it IS NOT safe to assume what is in print is always what the taxes will be for you when YOU buy it. Let’s discuss the various reasons. In the State of Michigan, and many other states, there are HOMESTEAD PROPERTY TAXES and NON-HOMESTEAD PROPERTY TAXES. Homes and condominiums that are classified as HOMESTEAD, typically means that the owner resides in the property and has claimed it as their principal residence. Under this classification, the property taxes are typically at the lowest rate. In contrast, if an owner does not occupy or claim it as their principal residence, it is referred to as NON-HOMESTEAD. This last classification is very typical for properties that are currently bank-owned or tenant occupied. An owner must own, occupy, and claim a property as their principal residence with their local assessing department prior to May 1st of each year in order to qualify for the lowest rate. So how does this affect you? Around this time of year, if you are purchasing a home that is currently NON-HOMESTEAD, the tax you may see on a property listing may lower as much as 35% upon you claiming a HOMESTEAD. Conversely, if you are not able to own, occupy, and file the essential document to claim your HOMESTEAD prior to May 1st, it is very likely you will have to pay all or a portion of the NON-HOMESTEAD rate for that year. The best people to discuss this issue with is your Realtor and/or the Assessor and/or Treasurer that has authority over the property in question. Last, another issue to consider is if the tax printed on a property listing is totally correct. At first glance, when researching taxes from a municipality’s website, the tax amount showing will reveal a total amount for the year. However, it is a good idea to verify the itemization of that number. For example, if a previous owner did not pay delinquent water bills or a ticket for a city ordinance violation, that cost will be placed on to the tax billing. This is more typical of bank-owned properties and those in the process of foreclosure. To find out the itemization, many municipalities show their itemized tax billing for each property online or are glad to discuss this topic over the phone or at their offices. Any one who is on the side that Michigan's property tax climate is good or "not bad" does not own a lot of property and is not a real estate professional. My name is Al Block. I am a RE/MAX agent in the Metro Detroit area. With out going into a lot of detail ... YET, "ad valorem" taxes in general are unfair. Here is the explanation that even the most liberal, tax-loving Michigander will agree with. Ad Velorem is a latin term that our property taxes are based upon ... based on the "value" of your property. If you study a tax assessor's field sheet, a majority of the value for your State Equalized Value which eventually trickles to your Taxable Value is the improvements to that land. Improvements are dwellings, out-buildings, and land improvements (driveways, walkways, decks, etc.). So, you take 2 property owners. The first guy/gal has a 1 acre lot with $50,000 of improvements. Another has a 1 acre lot with $100,000 of improvements. The 2nd person pays double the taxes. Please tell me why that would be fair. They BOTH own the same share of land in the city/township where they are located. They both breath the same amount of air, take up the same amount of space, it is just that the 2nd has more money. That is AD VELORUM taxation. Here is how Michigan, and many other states, can correct this issue. Property taxation would be based upon a property owner's fair share of the city/townships budget based upon their share ownership of land. Now, this proposal, I know would raise my own taxes. But what is right, is right. So, based upon my idea, if you own a 1 acre lot (using easy numbers here), you will pay half the tax burden as someone who owns a 2 acre lot, double your size, double your share. So, for simple math. If a city/twp. has a $100,000 budget to run all its services/government, and their are 100 land owners, all that has to be done is do the calculation of what their "share or stock" is in that city, and divy up the needed revenue. This way, there is no argument about taxable values, home values, or a big tax bill because some idiot builds a 5 million dollar mansion on a postage size lot. That idiot would still have the same taxes as someone who builds a 2 bedroom, 700 s.f. home on the same size lot. Why? Because their share of ownership of that town is the same. Think of it like a public corporation. If you own 100 share of stock, you have half the ownership value of someone who has 200 share of stock. I welcome debate if I am way off on this one. I have not even touched the surface on how our current property taxation system hurts property values, limits investment, and drives people into financial ruin. All I speak/write of is from "in the trenches" experience being on the front lines of Michigan real estate. Until you help people buy and sell properties, you don't really see the impact. MOVE FOR FREE!!! Suburban Detroit Realtor's answer to slowing economy. A picture is worth a thousand words and explains it all. 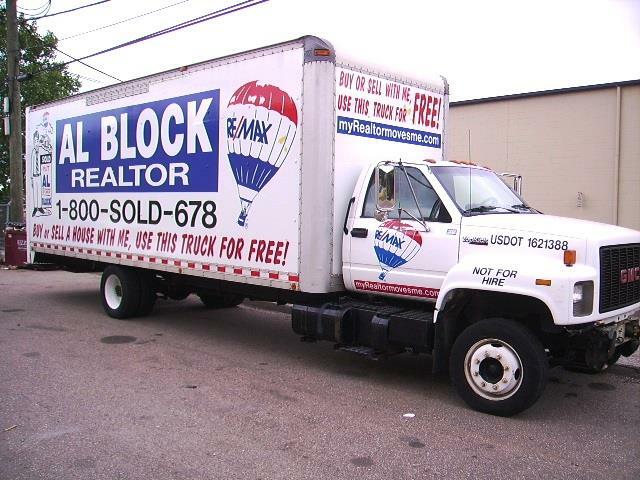 Al Block, a 20 year veteran of the real estate industry, has purchased a 24 foot commercial box truck for free use by his clients that either purchase or sell a property with him. Quoting Mr. Block... "I purchased this actually a year ago and really have not gotten around to spreading the news publicly, just basically telling my clients it is at their disposal if they wish. It also provides me a "neighborhood billboard" as it sits in a homeowner's driveway as they load it to move. It has really gone over quite well, especially the client can move at their leisure instead of renting a truck for one day and having to get it back. They can keep it as long as they wish, if no other client has schedule it. There really has been no issues, yet." CLICK ON THE PICTURE TO SCHEDULE THIS TRUCK FOR YOU. This is by far a very definitive collection of data and graphs collected by MIRealsource, Inc. MLS. Al Block, a 20 year veteran of the Metro Detroit real estate industry will serve on the Board of Directors of the largest local Association of Realtors in the State of Michigan. He served a term as Director of the Macomb County Board of Realtors from 1997-2001 and then served later as Vice-President of a newly merged organizition comprised of 6,700 members (Metropolitan Consolidated Association of Realtors) until 2004. Al Block has served in various capacities as Chairman of the Public Relations Committee and Chairman of the Grievance Committee. He has also served the Association in other voluntary capacities since the early 1990's. Al Block is an Associate Broker at RE/MAX First, Inc. in Clinton Township, Michigan and serves Macomb, Oakland, and Wayne Counties. He is a high profile, high volume Realtor and also a Limited Appraiser. Congratulations to newly-elected leaders. Click on Al's face to email him! Congratulations to (in alphabetical order) Al Block, Bill B., Susie M. and Pat R.. They received the most votes among the seven Board of Director candidates and will begin their terms in January of 2009. Thanks to all candidates and to the MCAR REALTOR® members who voted online. very reliable datea. Click here to open .pdf file. Statistical data compiled by Macomb County statistics courtesy of MiRealSource MLS. Please contact me if you are in need of any information more specific to your situation. I have the ability to compare dates fiscally, percentage losses based on style of home, type of real estate, etc.. Feel free to email me. Information is also available for other counties.